I’ve seen many people stumbling over collision detection for games. It’s a bit complicated to explain, so I figured I’d make one article I could link to. First, understand your coordinate space. (0, 0) is the top-left of the monitor. To the right, X increases. Going down, Y increases. (0, 1) is down from (0, 0). (1, 0) is right of (0, 0). It’s important to remember this because you’re going to have to do 2D geometry in this coordinate space. What does it mean for two objects to collide? The simplest form of collision detection treats all objects as rectangles and decides that two objects collide if their rectangles touch or overlap. A point that represents the top-left corner, a width, and a height. A point that represents the top-left corner and a point that represents the bottom-right corner. Notation used to refer to each rectangle. When doing collision math, I tend to work with the LTRB form. 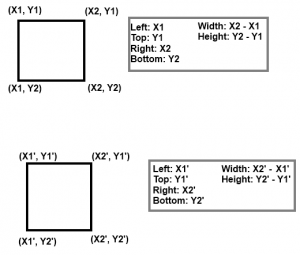 When drawing rectangles, I prefer the two-point form. 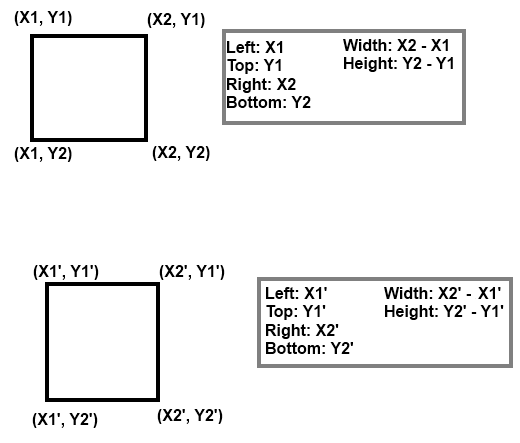 For the purposes of discussion, look at the image to see the names I’ll use for each rectangle in collision detection. Rather than try to fiddle with X1, X2, X3, X4, I’ll refer to the coordinates of the 2nd rectangle as X1′ (read “ecks one prime”) to indicate it’s coordinates of a different rectangle. I also annotated how LTRB maps to this, and included how you’d get width and height. I will be assuming that X1 > X2, Y1 > Y2, and so forth; if you don’t hold those rules this math gets much more tricky. I will order all of my examples to use < for the comparison because things would be more confusing otherwise. My examples require overlap for a collision; if you want to have touching objects collide replace my < with <=. In this case, we check if r2’s left edge is between r1’s left and right edges. That is, if X1 < X1′ < X2 we have a collision. X1 < X1′, but X1′> X2 so there is no collision. 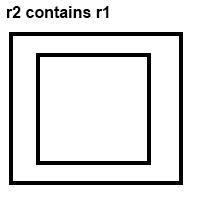 In this case, we check if r2’s right edge is between r1’s left and right edges. That is, if X1 < X2′ < X2 we have a collision. (1), but there is a collision because X1 < X1′ < X2. (2), but there is a collision because X1 < X2′ < X2. This is only half the story for reasons that will be illustrated later. For there to be a collision there has to be a vertical collision as well. Check r2’s top edge; collision if Y1 > Y1′ > Y2. No collision in this case because Y1′ > Y2. Check r2’s bottom edge; collision if Y1 > Y2′ > Y2. No collision in this case because Y2′ < Y1. 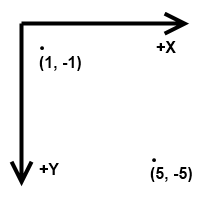 Similar to (1), but this time Y1 > Y1′ > Y2 so there is a collision. Like (2) but Y1 > Y2′ > Y2 so there is a collision. There’s a trick here; since moving down the monitor increases the value of the Y coordinate, we have to invert our assumptions of up and down. Normally, Y < Y’ would indicate Y’ is above Y, but on the monitor it indicates Y’ is below Y. The code addresses this by rearranging the comparisons. There’s one case these rules don’t catch. What if r1 is completely inside of r2? Neither edge of r2 will be in r1, so all of the tests will fail. When r2 contains r1, no edges overlap r1 but there's still a collision. Except in that special case, a collision only exists if there is both a vertical and horizontal collision. Why? If all collision checks are not true, there is no collision. The image illustrates. The dashed red lines are where edges overlap according to one of the tests.
' There is a collision. This isn’t the only way to do collision detection in games, but it is the easiest. The links below point to projects that demonstrate. How can this be modified to report the collision also? I am using logical AND to ensure the ball touches either side of the platform, a friend of mine did something similar and his works fine however when I try to implement mine am finding it isn’t doing anything eg the ball goes through the platform (nothing detected) could you give me some insight to why mine isn’t working please? I have done a break and checked each variable is pulling in the right values which seems to be correct. //check for ball is within the leftbound and rightbound. PS the 2 deltas cannot be inside the same IF statement as it would make the ball go vertical rather than horizontal. I think there is an error on your example. I have look your sample application, and there it’s okÃ©. I think this covers the simple problem of collision detection. The more complicated problem is how to efficiently detect what objects in a set are overlapping/have collided, without pairwise comparing each object against every other object, which has sub-optimal O(N^2). For this you need a spatial data structure of some kind, like a quad tree.